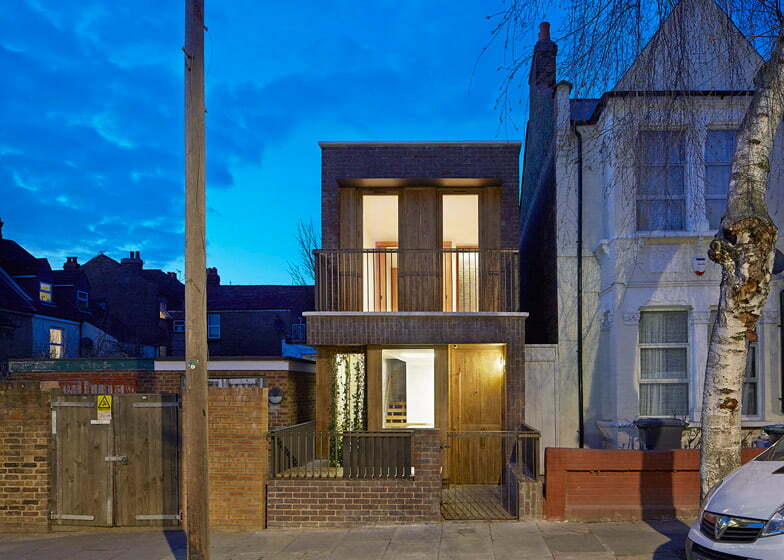 The Haringey Brick House transforms a decaying former garage plot into a new contemporary home. 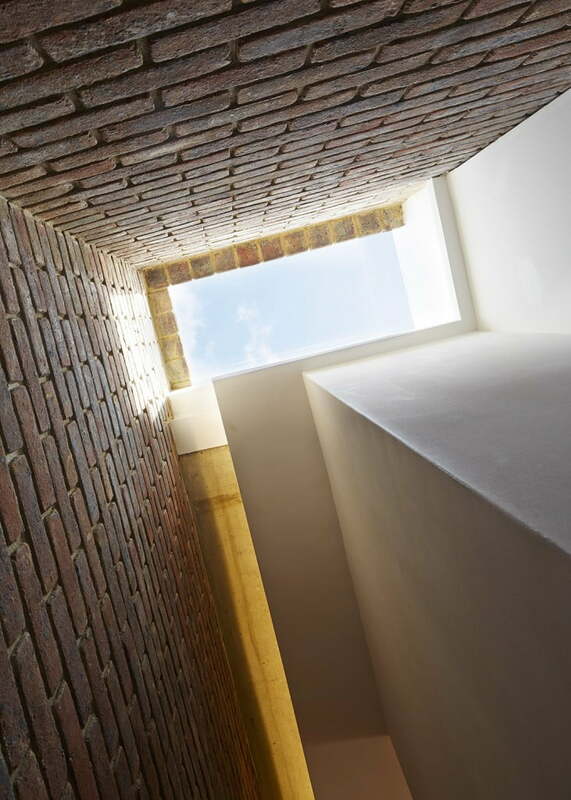 The Haringey Brick House has been shortlisted for the 2015 RIBA (Royal Institute of British Architects) London regional awards for architecture. The Brick house is situated at the end of a road, with Victorian semi-detached houses. The Victorian houses set up a strong rhythm of horizontal lines, vertical window proportions and brick bonding and this new home has a contemporary conversation with the neighboring Victorian houses. The use of different brick bonding both internally and externally defines the brick house building form and the internal spaces. 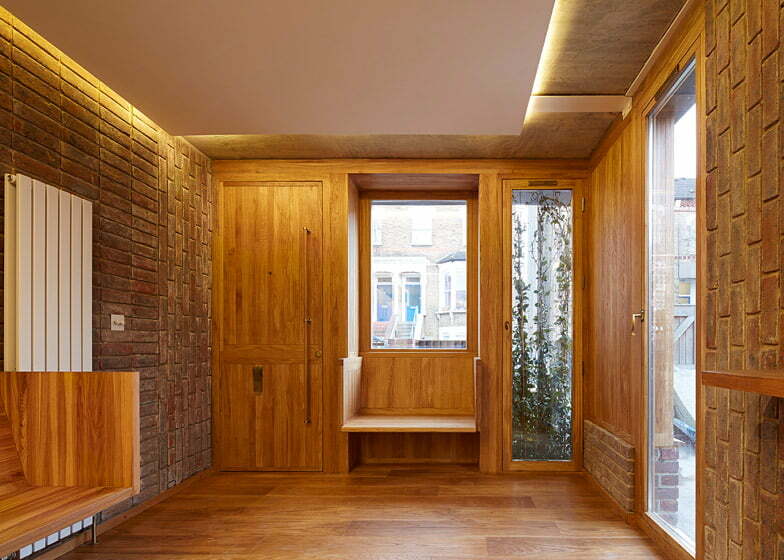 Oak windows and panels are inserted between the different brick bonding. The client had a garage laying dormant for 10 years. He approached us and asked us to do something with it. 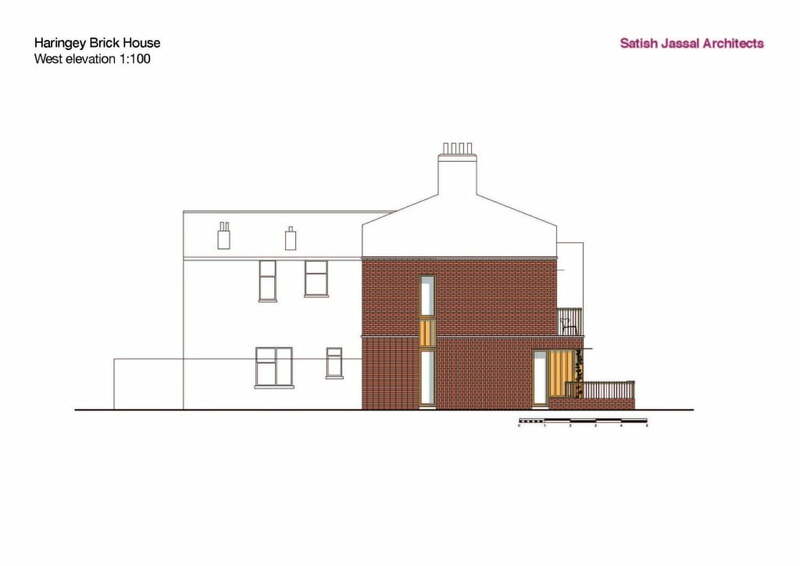 We successfully gained planning permission for a one bedroom house. The site measures 11 x 3.6 metres, and the building footprint is 3.6 x 8.6 meters. It was a challenge to get a house on such a small footprint. Due to overlooking issues we were only allowed to put windows to the side and to the front not to the rear. The budget was very tight, and the final contract value was only £170,000. The same price as an extension in most of London. We worked very closely with the contractor to achieve this price, and produced a full construction package for tender. 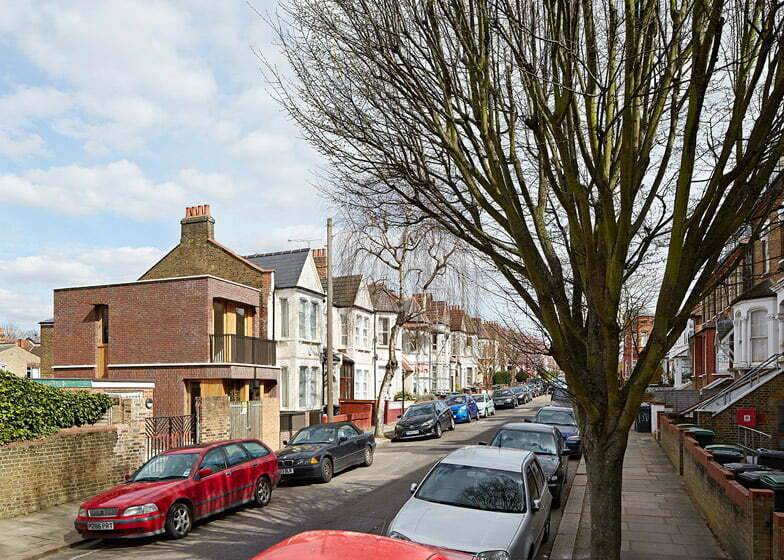 The site terminates a terrace of strong 19th-century Victorian townhouses. What is interesting about the existing Victorian townhouses is the vertical windows, the horizontal lines created by the window sills and the recessed entrances. The Brick house picks up on some of these elements to have conversation with the Victorian terrace, but not to imitate them. We try to have a contextual approach, we do not believe that every building has to be an icon for the sake of it. We believe that the best architecture should have some sort of meaning and talk to people. 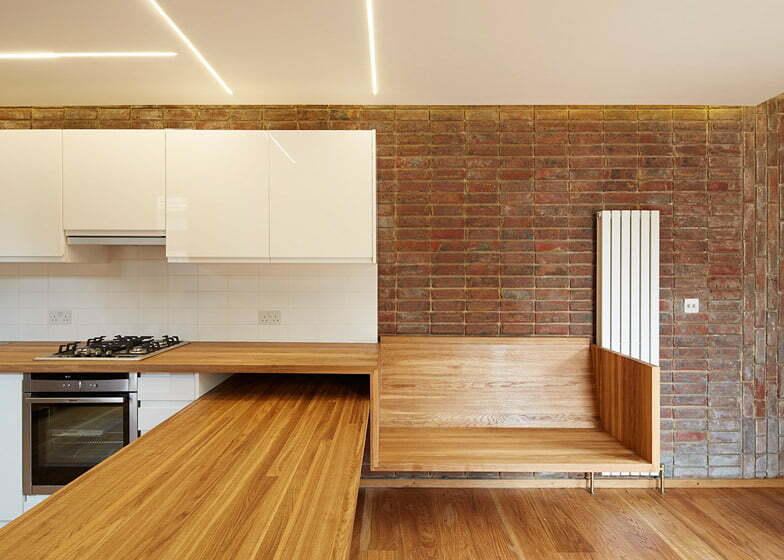 The Brick House Design concept really was to create a series of brick bonding types and insert oak panels between them. We have three brick bonding types the vertical staggered, horizontal staggered and stack bonding. The stone copings help to divide the bricks up. 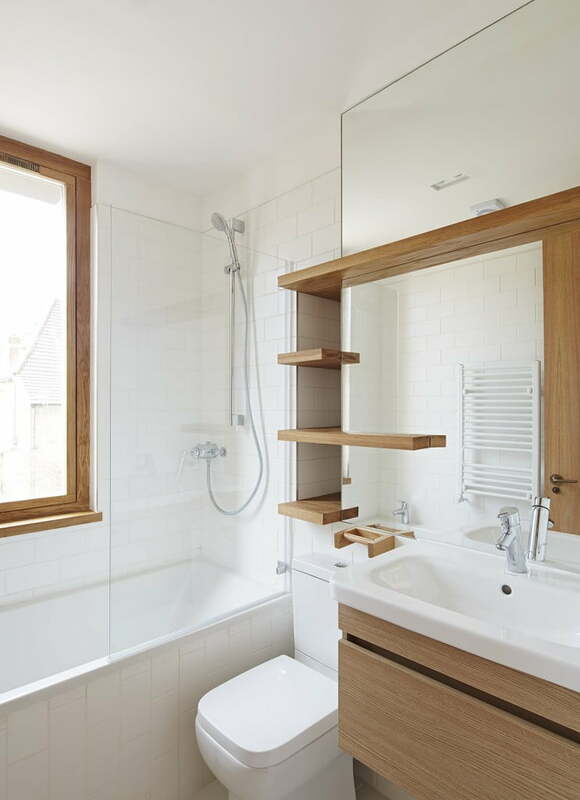 Planning regulations restricted the positioning of windows to the front and side of the house, but a skylight in the stairwell allows natural light to reach this space. 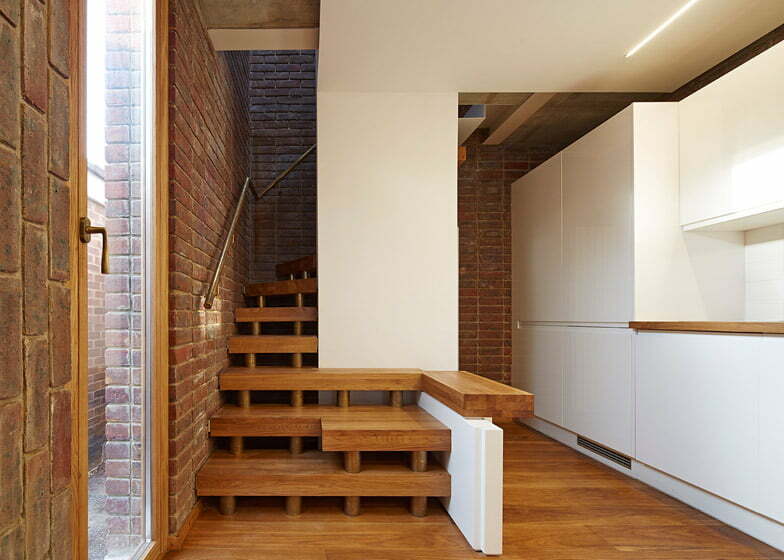 The staircase is formed from chunky wooden treads that follow the corner of the building as it ascends to the master bedroom on the upper storey. 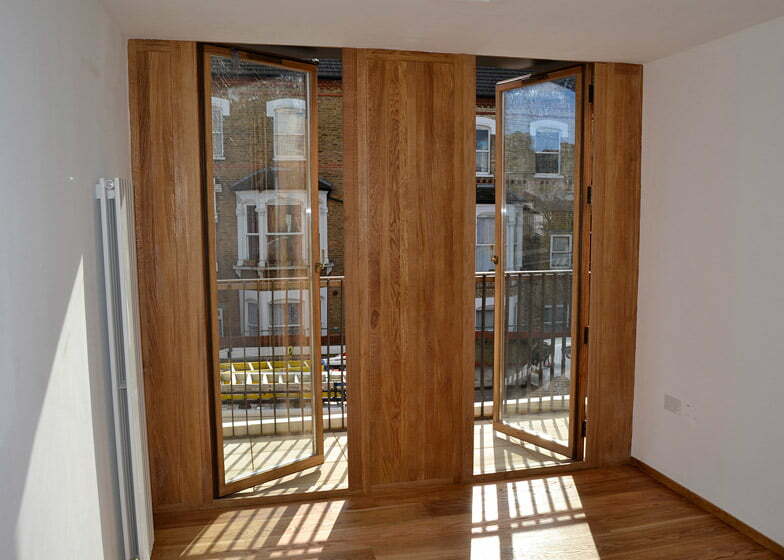 The bedroom features glazed doors that open onto a balcony overlooking the street. The frontage also incorporates a trellis covered in ivy, while a bench alongside the front gate houses the electricity meters. 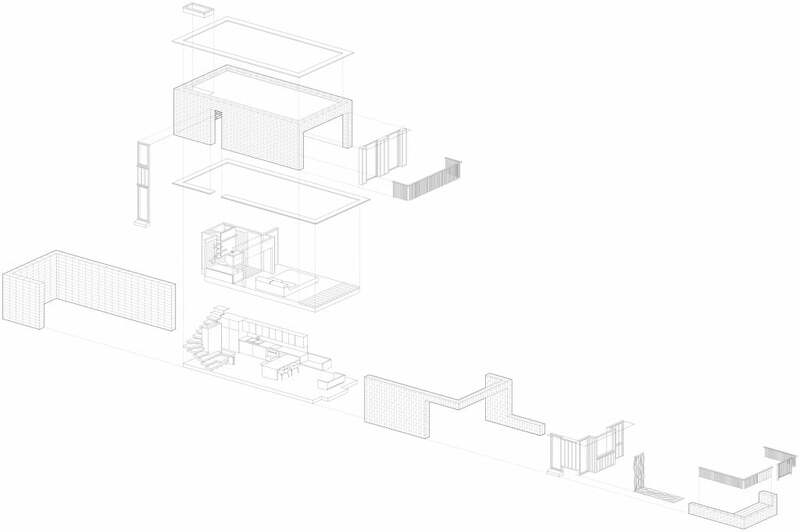 The building’s side elevation corresponds to the depth and height of the neighboring terrace, while a stepped section accommodating a first floor balcony extends to match the building line of the terrace’s bay windows. 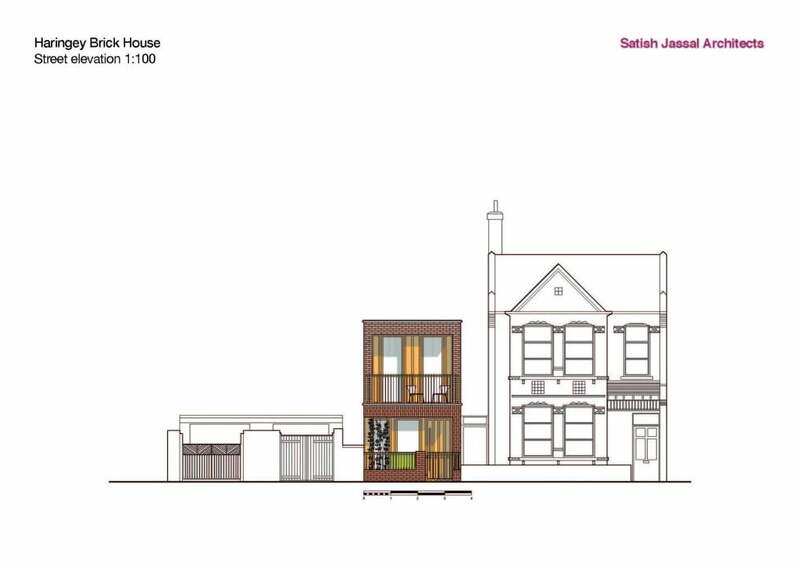 The Brick house picked up on some of these elements, such as the vertical windows and horizontal lines, to have a conversation with the Victorian terraces but not to copy them. 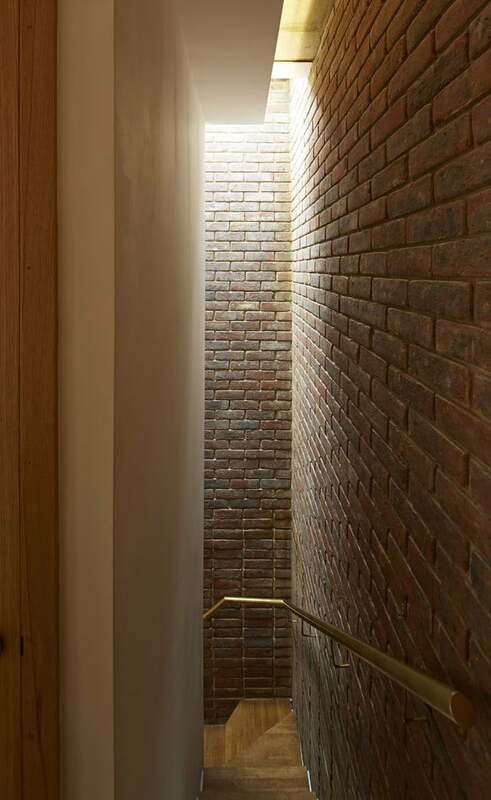 To tie in with the materiality of the Victorian housing, the architects used brick for the majority of the exterior. However, red-colored bricks were used instead of the traditional yellow London stock and a variety of bonding patterns were employed to create a contemporary aesthetic. Vertical and horizontal stretcher bonds are used for external walls where they combine with stone copings that distinguish the different levels. 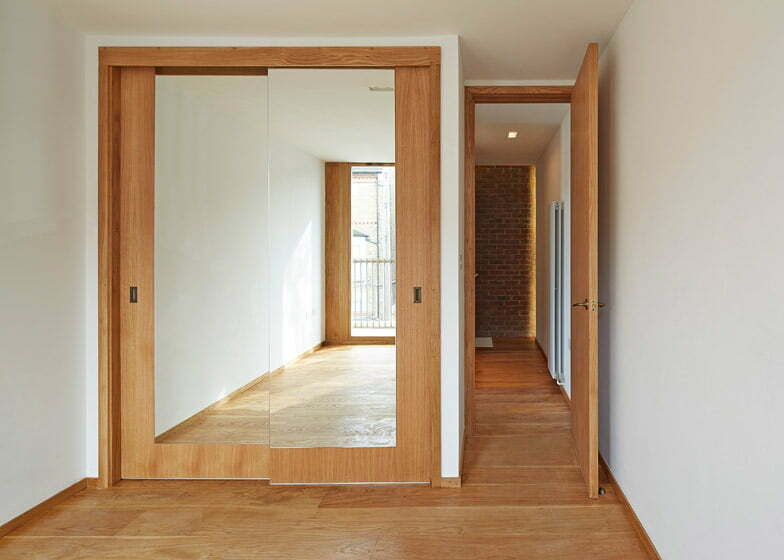 Oak joinery used for the door and window surrounds contrasts with the brick facades. Internally the oak becomes fixed furniture. 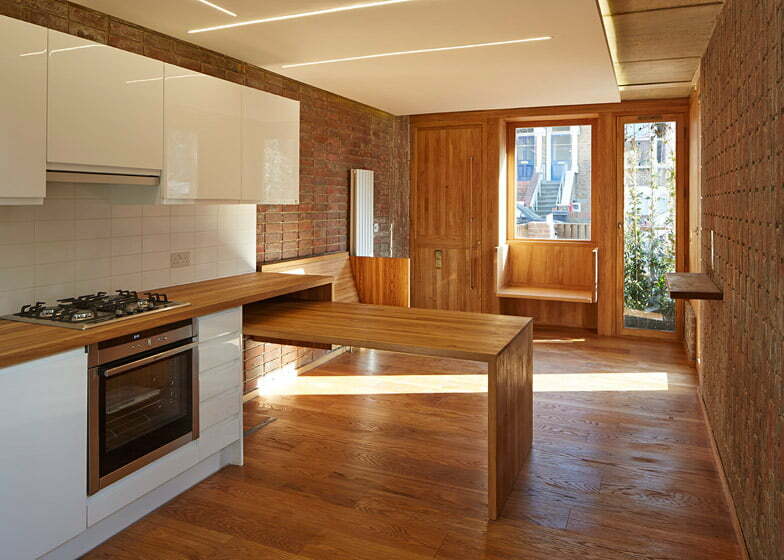 All the furniture is bespoke to help fix the layout due to the size of the house. 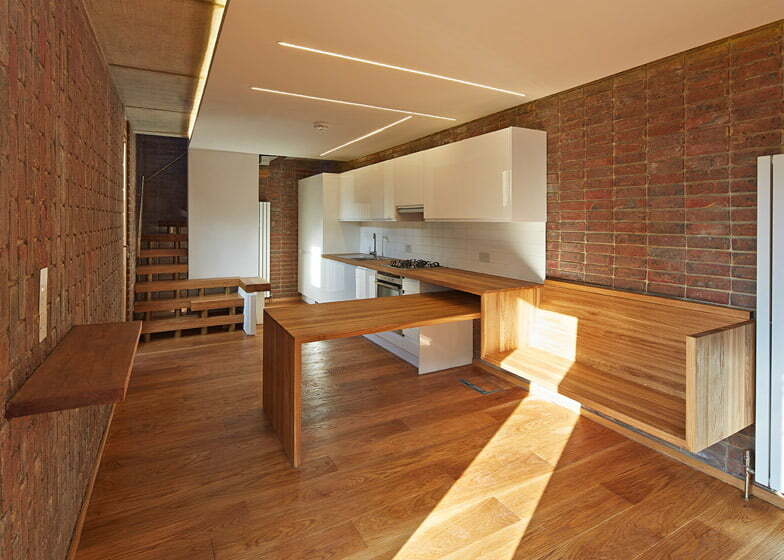 The materiality of the building was very important and the use of brick, antique brass and oak. They all have an inherent quality that they actually get better with age. There also moments where some of the steelwork and concrete is exposed telling you how the building is constructed. This is our first new build house and in a way we are testing our ideas for future projects. 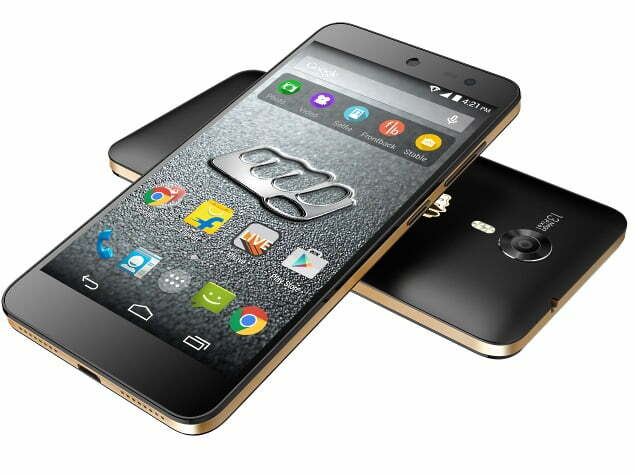 The client has been very good he let us manage the process and was supportive. He really loves the Brick house and had become very protective over it.